All timekeeping machines need something as the reference. Sundial uses the sun, Mechanical clock uses pendulum, Mechanical watches use balance wheel, and Quartz watch uses quartz crystal. For atomic timekeeping, atoms are used. Atomic clocks do not use radioactivity, but rather the precise microwave signal that electrons in atoms emit when they change energy levels. Early atomic timekeeping machines were masers with attached equipment. Currently the most accurate atomic timekeeping machine is based on absorption spectroscopy of cold atoms in atomic fountains. Since 1967, the International System of Units (SI) has defined the second as the duration of 9,192,631,770 cycles of radiation corresponding to the transition between two energy levels of the caesium-133 atom. Comparing with the quartz crytal, 32,768 Hz, Atom gives out a much higher reference frequency which maintains an accuracy of 10-9 seconds per day or 1 second per 2,739,726 years !!! I do think you are going to buy an Atomic Watch becuause of its accuracy; however, you cannot. This is because there is no such thing at this moment. This is because even the smallest Atomic Clock is bigger than a desktop PC. 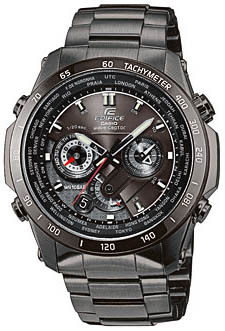 On the market, there are many "Atomic Watches", they cost as low as US 25, but they are not atomic watches. These atomic watches are Radio Controlled Watches --- A watch can automatically adjust the time according to the Radio Signal. The Most famous and common Radio Controlled Watches are designed by Casio, it is called Wave Ceptor which the radio-controlled function of the high-end products is multi-region, allowing you to switch from UK, USA, Japan, China and mainland Europe transmitters. The Wave Ceptor range will also automatically adjust for daylight savings time. The one on the left only accepts US WWVB, UK MSF Frequency: US, UK 60kHz signals. This one is one of the high-end products which accepts UK, USA, Japan, China and mainland Europe signals.